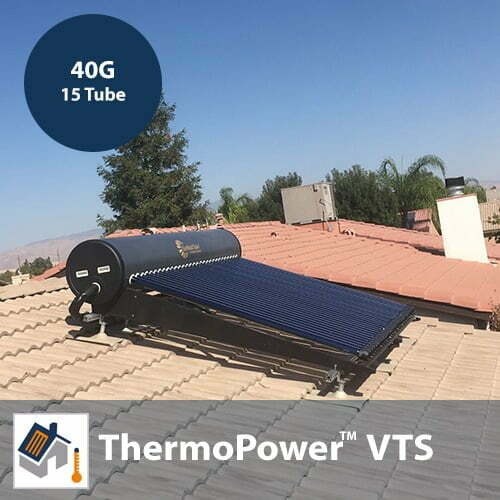 SKU: ThermoPower-VTS-HP15-G. Category: Thermosyphon Solar Hot Water. Our DIY residential solar hot water systems are complete packages that are ready to install and provide affordable, efficient solar hot water in warmer climates where cold days are few and far-between. Each system includes a heating tank and high-efficiency solar collector integrated together for simplicity and affordability. By preheating your hot water with our ThermoPower residential solar hot water kit, you will dramatically reduce your energy costs for water heating, which, for the average household, translates to a savings of hundreds of dollars every single year. SunMaxx offers permitting & PE engineering assistance. Please contact your sales representative for further information and pricing. 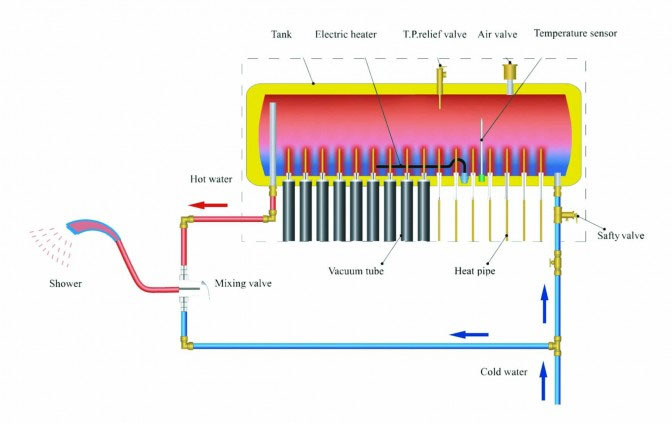 How to mount the VTS solar collector? Each unit, includes a main frame (with approximately 10 degree angle when mounted on flat roof). The base mounting does not include hardware / lag bolts, for connecting the collector into the roof surface. The following items are required for mounting to an asphalt or metal roof. Assembly below includes rated lab bolts and hardware for handling the load rating of the solar collector. Substituting non-SunMaxx mounting hardware will void the system warranty. For mounting to standing seam roof, please confirm the standing seam roof type prior to ordering. The following items are required for mounting to tile roof (Spanish tile, ceramic time, cement tile). The following items are required to ensure the system can safety operate. Failure to integrate these system components into the design will result in voiding of the collectors warranty. XMaxx-HW-VALVE-75PSI-3/4IN-T&P 1 T & P value to ensure pressure of VTS does not exceed 75PSI. ThermoPower-A-VHP-58X1800MMTUBE-10 1 Box to spare glass tubes (heat pipes from the collector can be re-installed inside of glass tubes.